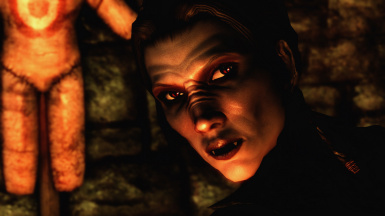 This mod changes the fangs and eyes of vampires. 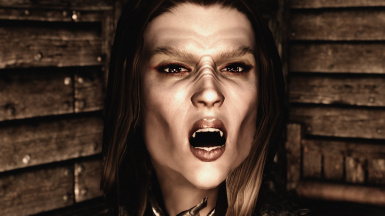 Fangs are shorter and now present for females. 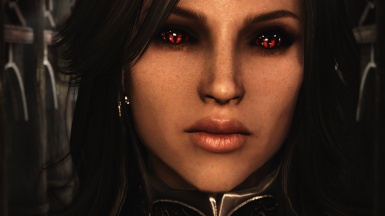 Eyes include new textures as well as glowing and non-glowing meshes. 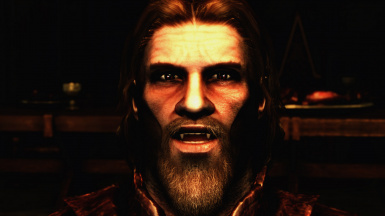 Since the eye resources are not 100% created by me, please do not use them in other mods. 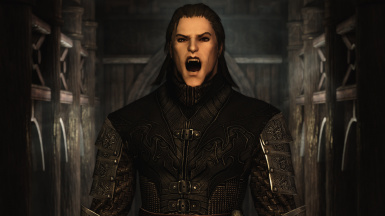 The mouth TRI files, however, I give full permission to use in follower/NPC mods (custom and overhauls alike). I just request that you credit me and link back to this page. 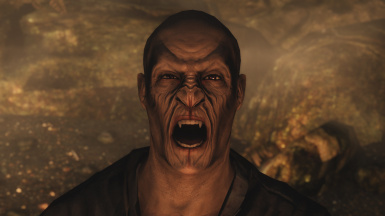 Added a new main file that includes fangs and new glowing eyes (see images). Includes an updated eye mesh that retains glow, but also includes the double sided lashes and invisibility fix. ATTN SKYRIM SPECIAL EDITION PC AND CONSOLE USERS! 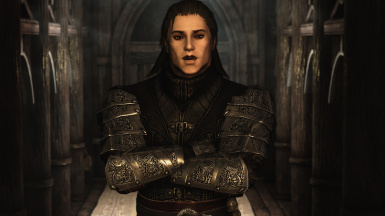 I will be porting all my mods to SSE for PC, and all but DVA (because SKSE) for consoles. Porting will start in December (getting new computer) so it will be a bit of a wait, but I am planning on updating each and adding a bit more content so hopefully it will be worth it. To impatient players and modders: I'm totally fine if you want to port them for personal use, but do so at your own risk and please do not post them. Some will be getting quite a bit of clean up to get the size down, and running the current mod and then updating may cause issues. 1.1 - Added a new main file that includes fangs and new glowing eyes (see images). Includes an updated eye mesh that retains glow, but also includes the double sided lashes and invisibility fix. If you've previously installed one of the other two packages, this can be installed over top, just replace all files. 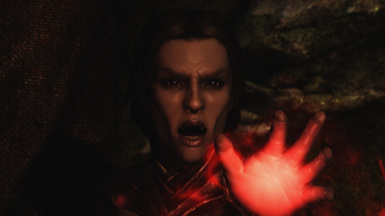 Serana, Valerica and Harkon replaces their headmeshes with new ones that don't have glowing eyes (everything else is original though). This is not my stand-alone replacer, but for those who don't want to wait for it or want these characters to look close to vanilla. ECE Patch has been added. If you are using ECE, please install your desired main package first, then install the ECE patch and overwrite when prompted. 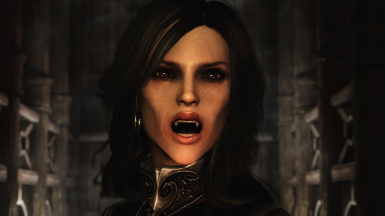 This mod changes the fangs and eyes of vampires to make it more believable that they could mingle with humans. 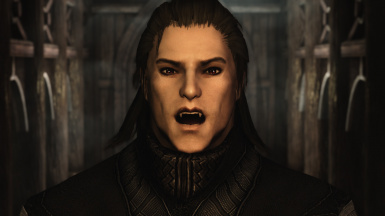 Fangs are shorter for males and now present for females. Eyes are non glowing and red but a little more subtle. This mod does not effect Khajiit or Argonians. 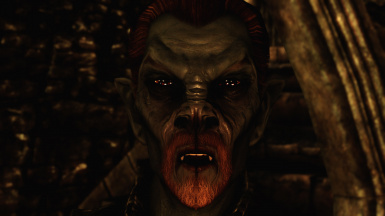 Orc vampires will get the eyes from this mod, but not the fangs. Fangs and Glowing Eyes - Includes fangs and an updated eye mesh that retains glow, but also includes the double sided lashes and invisibility fix. New glow compatible textures also. 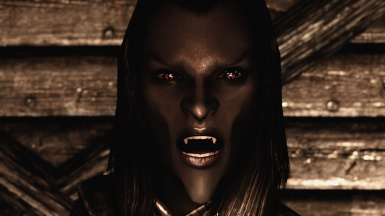 Serana, Valerica and Harkon - I'm moving this file to the old file section because Madcat221 has released a new mod that does the same thing except with fangs! Big thanks to him for releasing it. And he's released both a glowing and non glowing eye version. ECE Patch - If you are using ECE, please install your desired main package first, then install the ECE patch and overwrite when prompted. MrLenski for his Covereyes mod. Nuska for her awesome tutorial on editing TRI files. DoubleH for testing and screenshots. Bethesda for making this wonderful game and supporting the mod community.